Social Login allows your users to connect with one click to your OpenCart 2.x shop by using their social network accounts. Gather rich demographic information (age, gender, phone numbers ...) about your users without requiring them to fill out any forms. Obtain pre-validated email addresses and increase your data quality. Social Login seamlessly integrates into your OpenCart shop so that you and your users don't have to start from scratch. Social Login increases the user registration rate of your shop by simplifying the registration process. Get rid of long forms and complicated captchas by allowing new users to sign-up with their existing social network accounts. Your existing users can furthermore link their regular account to one or more social networks and can then use these social network accounts to login. Eliminate the issues of forgotten usernames and passwords! The download links are on the right side of the page that opens when you click on the button below. 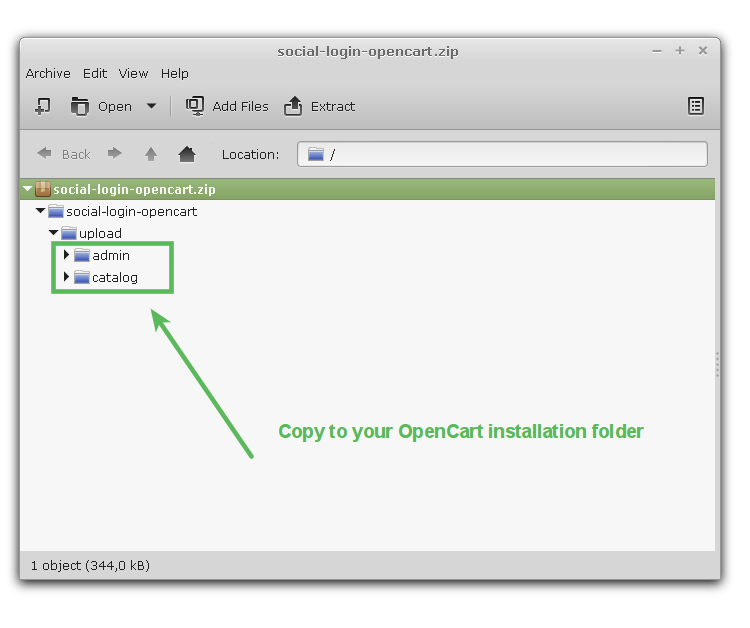 Locate the /upload/ folder inside of the downloaded .ZIP file and extract all included files and folders to the root directory of your OpenCart installation. Existing files have to be overwritten. 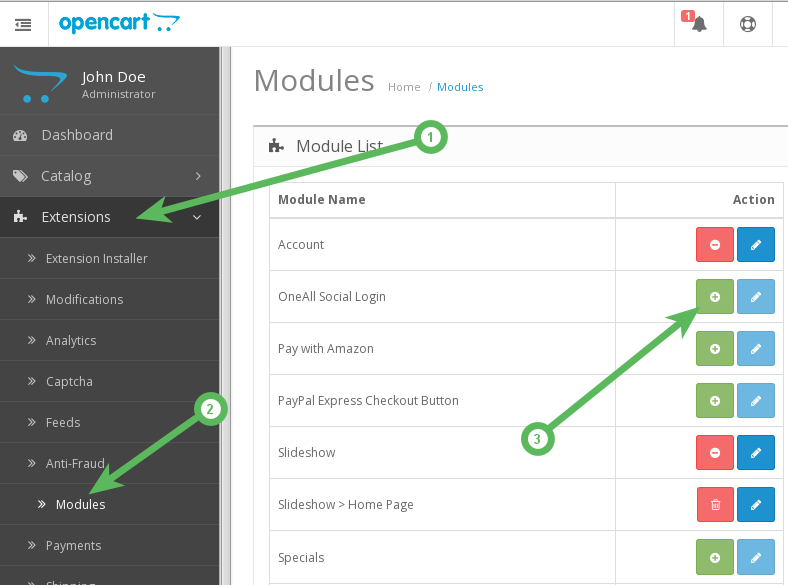 Login to your OpenCart administration area and navigate to Extensions \ Modules. Then look for the module Oneall Social Login and click on the Install button. 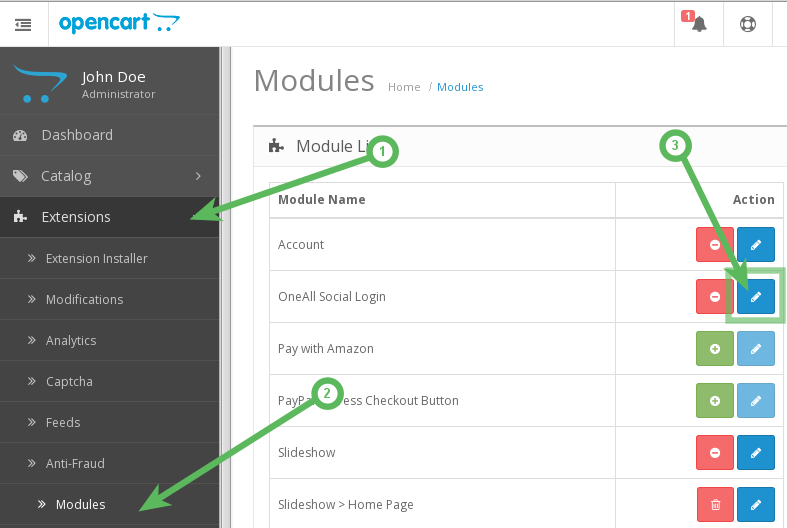 Login to your OpenCart administration area and navigate to Extensions \ Modules. Then look for the module Oneall Social Login and click on the Edit button. Click on the Autodetect Communication Settings button. You should receive a green success message if your server is able to communicate with our API. Your firewall must allow outbound requests on either port 80 or 443. To obtain your API credentials, please login to your OneAll account and open the page Site Settings \ API Settings & Credentials of a Site. Fill out the API credentials in the OpenCart administration area and click on the Verify API Settings button. You should receive a green success message if your credentials are correct. Enable the social networks that you would like to use by ticking the corresponding checkboxes. First open the Social Login settings in your OpenCart administration area and make sure that the Social Login Status is set to Enabled. Then click on the Layout Positions tab on top of the page and add Social Login to the positions where it should be displayed. Social Login might not be displayed correctly if you have enabled the JS minifier in the System&Performance settings of the Journal theme. To fix this problem you can either open the Journal System&Performance settings and set Minify JS to OFF, or open the Social Login settings and set Social Login Loading to Inline. Feel free to fork our OpenCart GitHub repository to contribute to the development of this extension.